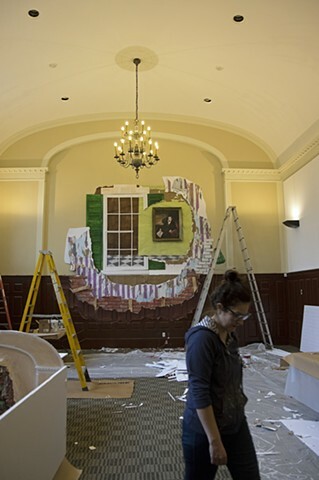 "For her project at Drew University, Hegarty is creating a false excavation site within the former chapel of Brothers College: a Brobdingnagian rabbit hole in the middle of a wall that is part time machine, ossuary, and scrying mirror. It is here that the spirits of the university will commingle with the spirits of the artists past. The striped purple and white wallpaper created from childhood memories of her parents bedroom are conflated with an interior/exterior view of Mead Hall in the wrong direction, where a singed-out portrait of Daniel Drewdevout Methodist, unrepentant capitalist, self-serving fabulisthangs lopsidedly in the wreckage. It will be here that Hegartys theatrical backdrop becomes the star performer, blurring the boundaries between past, present, and futureand through all these layers of artifice well find the truth, always shifting, always elusive."